OSN Pay-TV distributors in Oman threaten to take drastic measures against illegal DTH receivers of India. Official Pay-TV platform distributors of OSN have said that in coordination with Oman's customs department, they will take drastic measures against the availability of illegal decoders (STB) from Indian direct-to-home (DTH) operators. OSN is a direct-to-home satellite TV provider serving the Middle East and North Africa. Although Indian DTH operators do not have the license to provide services in Oman, many electronic retailers sell prohibited decoding receivers that allow consumers to watch Indian television channels at a very low price. 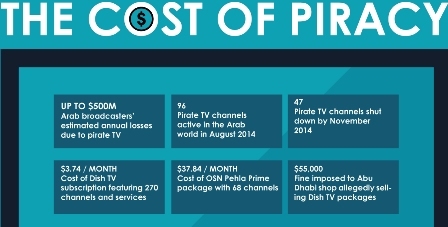 The illegal use of Indian DTH services in Oman has caused a great loss for OSN, which pays millions of dollars to content providers but can not monetize the content due to piracy. "It has recently been observed that you see a number of activities and in a wide range of stores that sell satellite receivers, where the store owners present some illegal satellite receivers as legal devices, while they contain all the rights of Orbit Showtime Network (OSN) legal channels in terms of content and programs These devices are branded by Dish TV, Airtel, Tata Sky and other similar devices, "OSN distributors said in a statement. In addition, he stated that these devices are prohibited to sell and trade within the sultanate and the rights are granted only to the OSN. "The owners of the stores enter these devices in the territory of the Sultanate and trade with the devices without complying with the laws and without registering with an agency with a name," the statement added. The statement also pointed out that the illegal use of Indian DTH services is contrary to the provisions of intellectual property laws, especially the Industrial Property Rights Law issued by Royal Decree 27/2008, backed by the provisions of the Law on Intellectual Property. GCC Marks issued by Royal Decree 33/2017 and the Law of Copyright and Related Rights issued by Royal Decree 65/2008, and other related laws, will take the necessary measures for offenders. 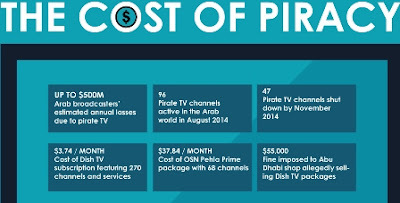 "The trade in illegal devices has caused serious damage to OSN within the sultanate, as the official agents of the OSN channels pay millions of rials a year to obtain commercial agency rights and OSN pays millions of dollars to obtain transmission rights within the GCC: These acts in the term have a great direct impact on the economy of the state, "the statement said. The official distributors of the OSN channels affirmed that they follow the complaint with the competent authorities regarding the offenders until the necessary measures are taken. "The necessary procedures, in coordination with the General Directorate of Customs, will prevent the entry of receivers with the brand names (Dish TV, Airtel and Tata Sky) through all the commercial channels in all the points of sale and will avoid the permit for re-export. "The statement noted.